2015 Road Trip Photos #6: Faces of the Revolution « Midlife Crisis Crossover! 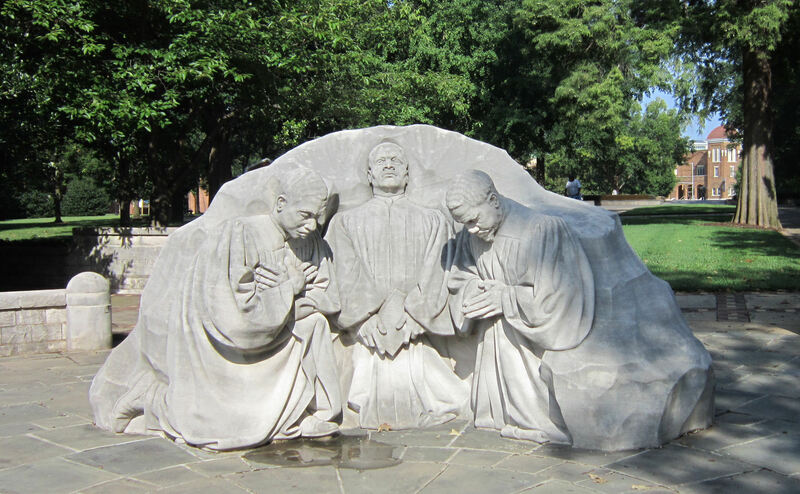 A trio called “Kneeling Ministers” stands at the park’s southeast entrance — Reverend N. H. Smith, Reverend John T. Porter, and Reverend A. D. King. 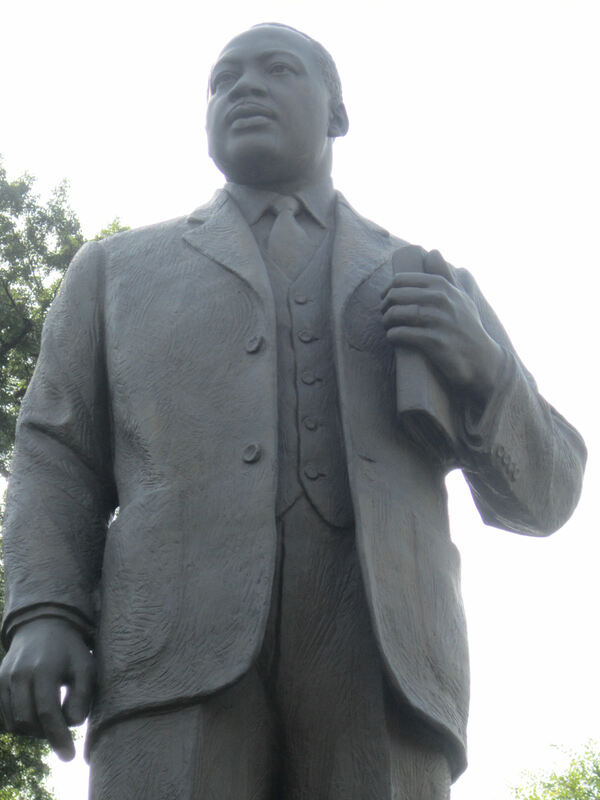 You should know Reverend A.D. King’s older brother, Reverend Dr. Martin Luther King, Jr.
A pedestal can only contain so much of the man. 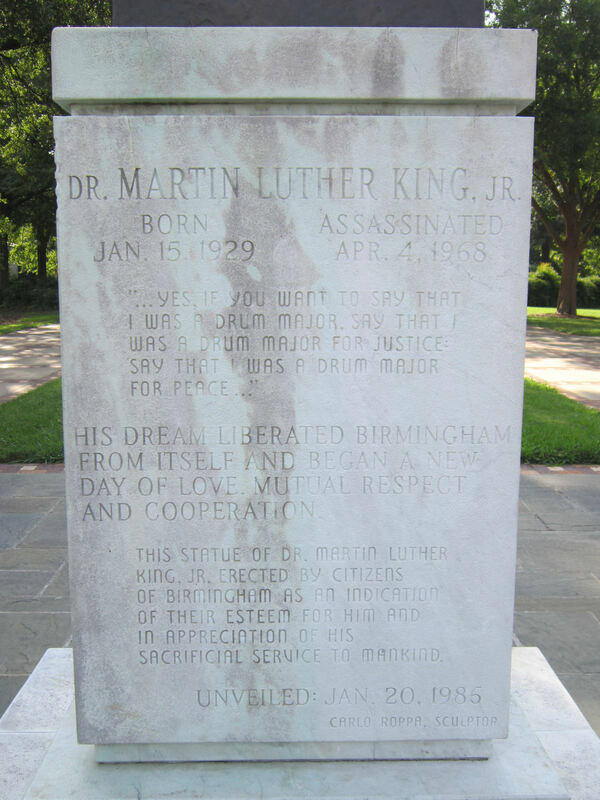 Along with the people’s gratitude and veneration, it displays a quote from one of his many notable sermons, which can be read online for greater context. 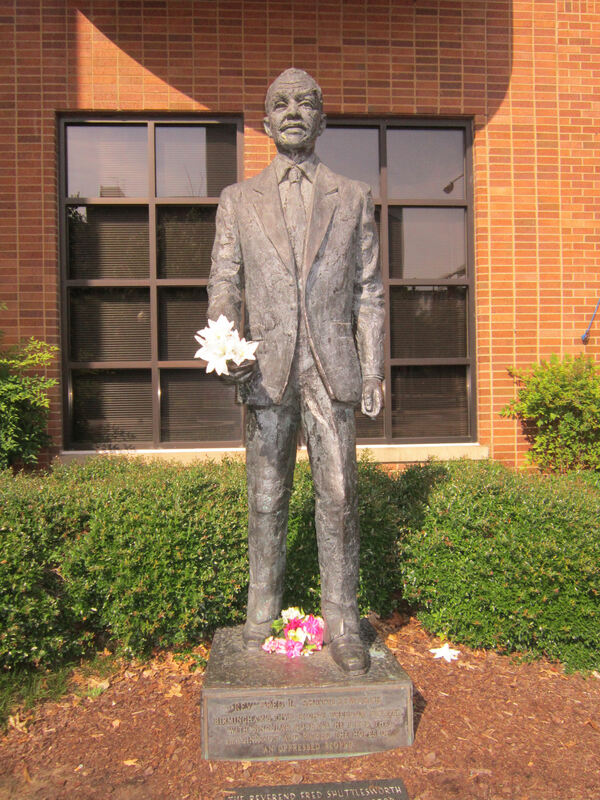 Across the street from Dr. King is Reverend Fred L. Shuttlesworth, a fellow co-founder of the Southern Christian Leadership Conference who made his own significant contributions to the Civil Rights Movement. 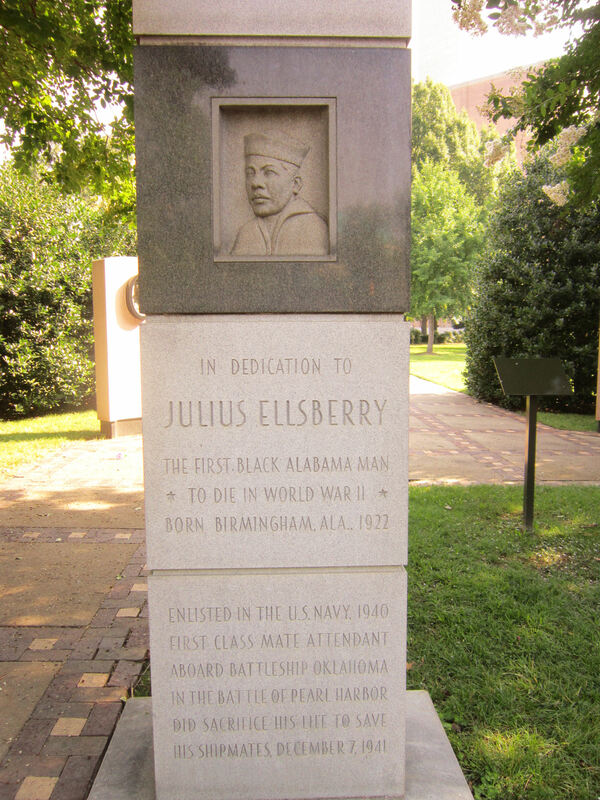 Not all of Birmingham’s hometown heroes receive statues in Ingram Park, but a few receive free-standing markers — e.g., Julius Ellsberry, Alabama’s first black casualty in World War II. 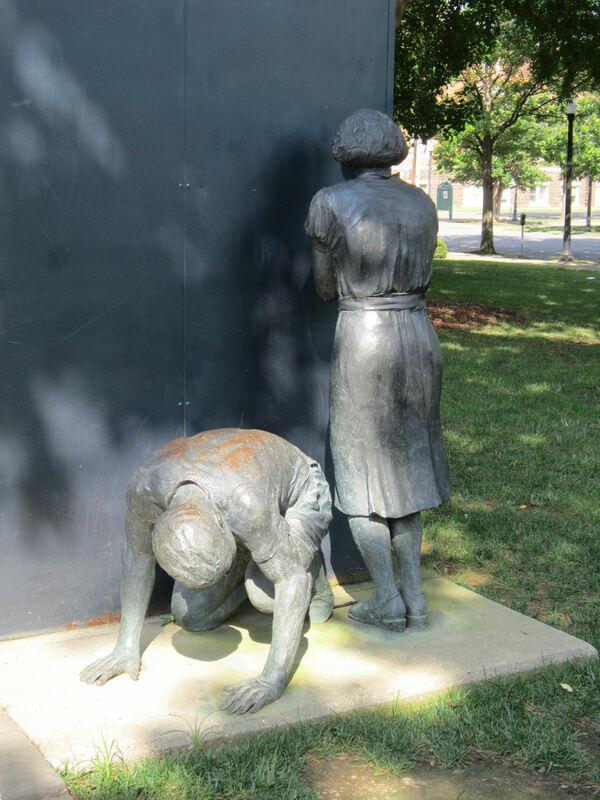 Not all of the faces on these statues connect to Wikipedia entries. 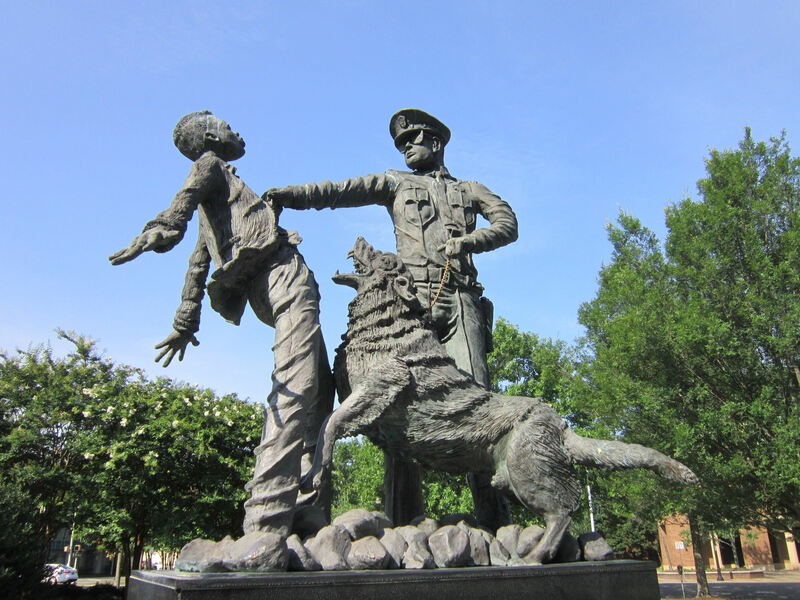 Ronald Scott McDowell’s 1995 tribute “The Foot Soldier” remembers those protestors young and old who faced down police dogs sicced upon them by Bull Connor, Commissioner of Public Safety. 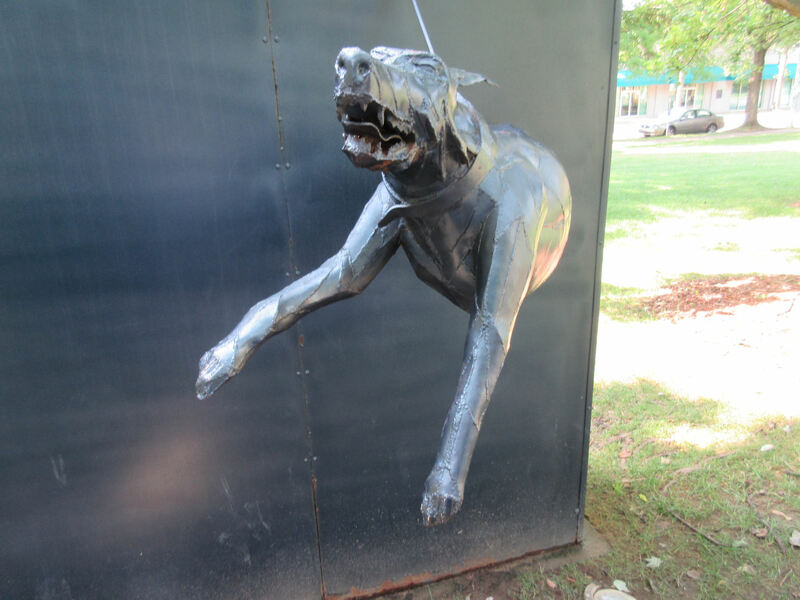 Further down the same sidewalk, art becomes a gauntlet that vivifies the same attack-dog reality in a face-first third dimension. A few feet to one side, life goes on and the uncaring sun continues to shine. But in front of you is a commanding visage trained for flesh-rending barbarism in the name of so-called law-and-order. On the north end of the park, a pair of young demonstrators fumble to protect themselves, laid low by the forces summoned against them. Step back several feet and view the scene from behind the trigger of a high-pressure water hose. This crowd-conquering method saved on bullets without sparing its targets any pain, all courtesy of Birmingham’s 1960s tax dollars at work. 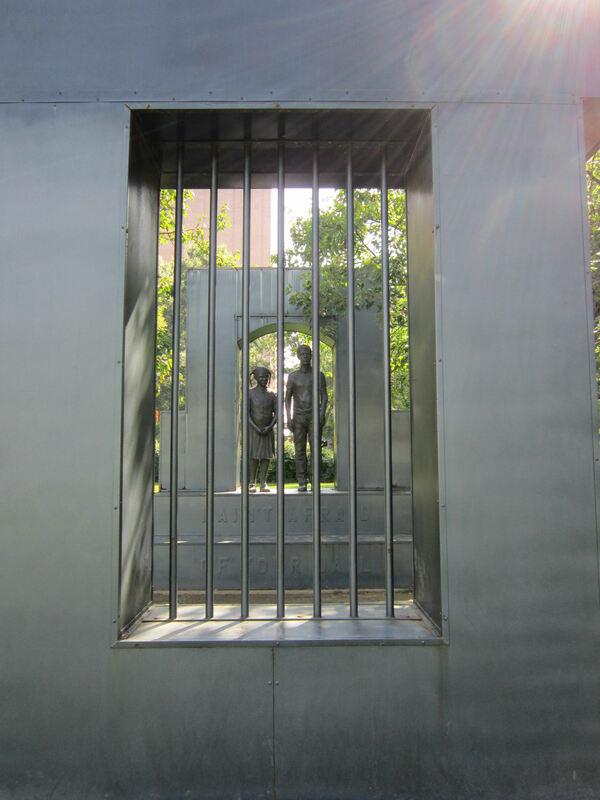 Near the west end of the park, James Drake’s “Children’s March” finds another pair of teens differently suppressed by the ruling authorities over abhorrent differences in racism. 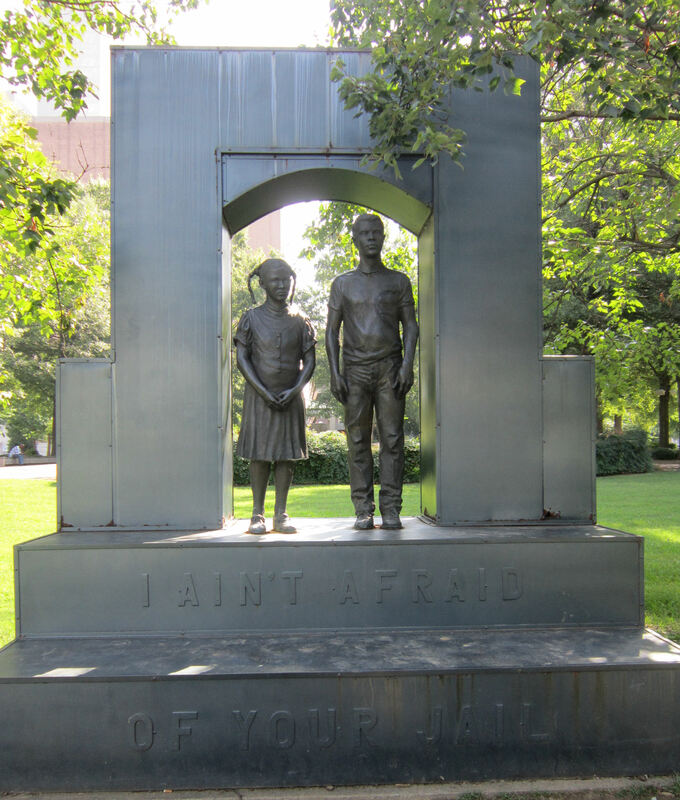 Step around those ultimately powerless bars, and the children stand free, representing for the future of Birmingham and America, ready to fulfill the efforts and dreams of the elders who marched with them and in too many cases died for them. 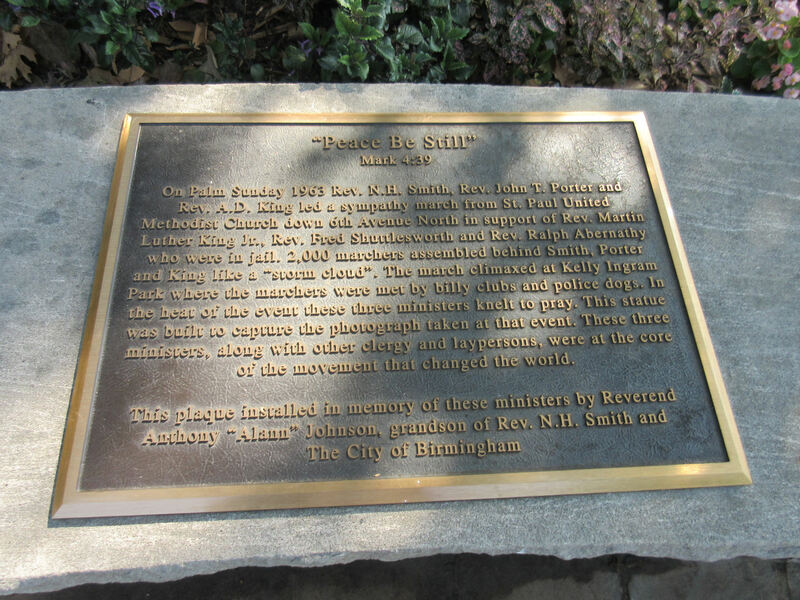 This entry is part two of a three-part miniseries-within-a-series sharing the sights and solemnity of Kelly Ingram Park. 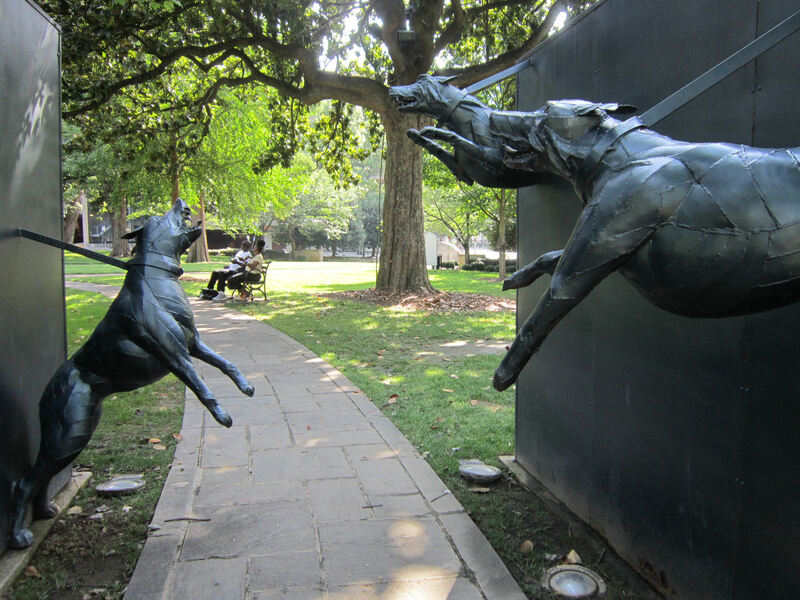 These weren’t even the most powerful statues around. 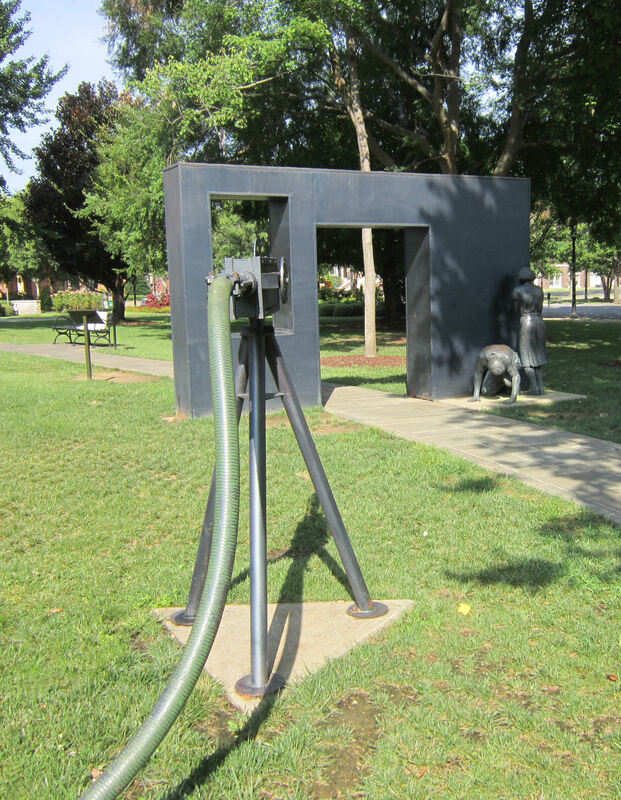 The park is a reminder of the harsh past. Fifty years from now I wonder what will be remembered about decaying schools, homeless, and another generation of people in poverty. 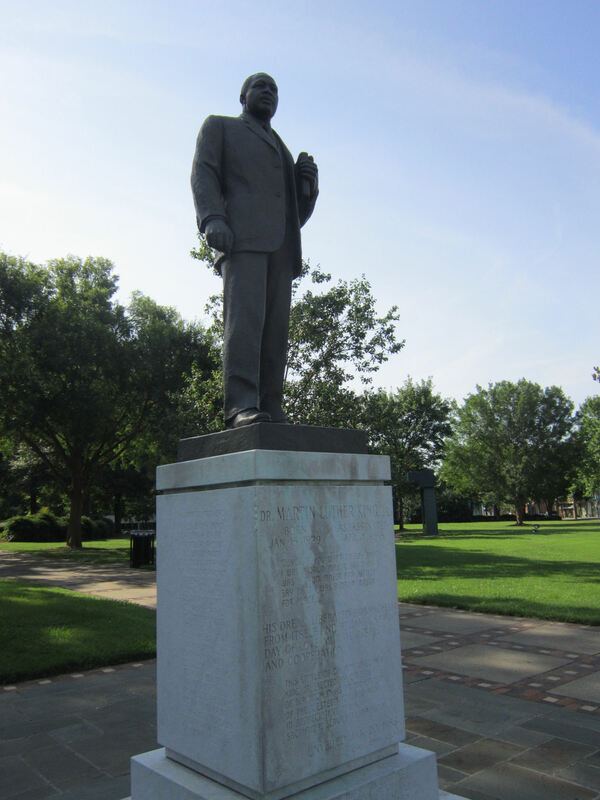 Parks and statues are nice. They serve as common ground. Schools and jobs are nice too. That is what creates equal ground. Nice pics, Randall. Thanks. Their downtown certainly has plenty of empty storefronts and spaces where more businesses and jobs could fit if they wanted to. A shame it’s not that easy, I’m guessing.